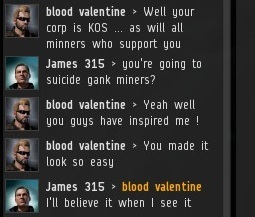 Previously, on MinerBumping... blood valentine of the Flower Revage Cartel began uttering mysterious threats against the New Order. 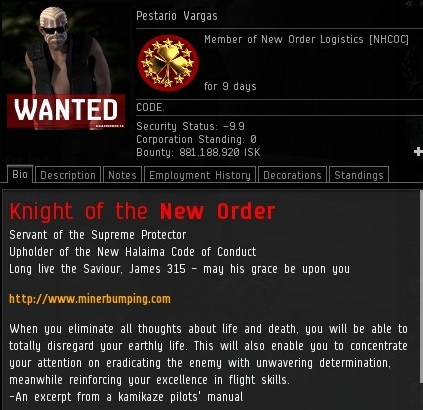 He claimed that on March 1st, a terrible fate would befall anyone pledging loyalty to the New Order. When I paid a visit to Brapelille, valentine initiated a private convo. Introductions were made. 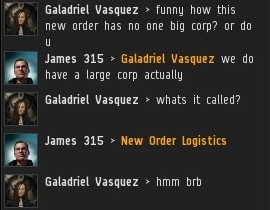 Well, my introduction was made. I didn't ask who he was. 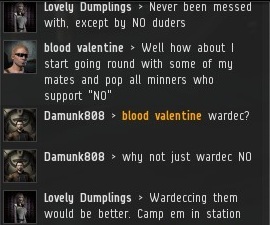 valentine spoke on behalf of a miner who had some excuse for not following the Code. 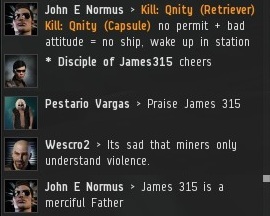 But the decision to destroy the miner's ship was not overturned. With the pleasantries out of the way, it was time to get down to business. 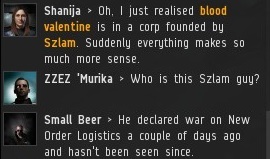 At long last, we would discover the identity of the mastermind behind Flower Revage Cartel and the mysterious March 1st deadline. Disappointingly, it was the old "anonymous employer" gambit. 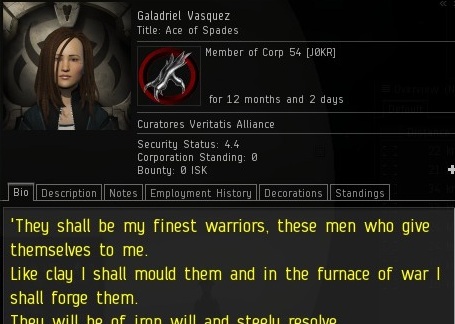 In all of EVE's history, I doubt more than 1% of supposed "mercenary contracts" involved an employer who actually existed. 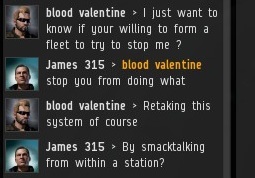 valentine urged me to fly into action to stop him. But it wasn't clear exactly what I was supposed to be stopping. Our enemy's "occupy the ice field" movement struggled to exert any leverage. 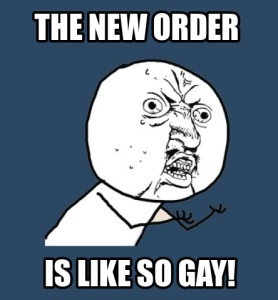 The New Order acted according to its own wishes, as usual. 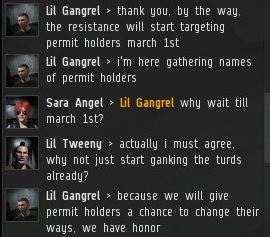 Many have promised to suicide gank the permit-holders, but none have attempted it so far. 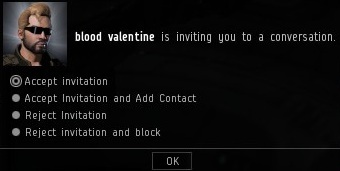 Will valentine be the first? Unfortunately, we would need to wait until March 1st to find out. Out of nowhere, I was convoed by Szlam, the founder of Flower Revage Cartel. Would answers be forthcoming at long last? 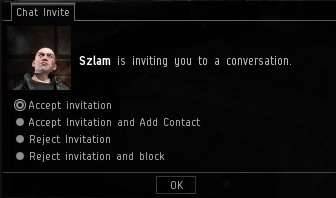 In fact, Szlam wanted to talk about another matter. As with others who complained about their appearances in MinerBumping, Szlam was responsible for his own words, which he readily conceded. 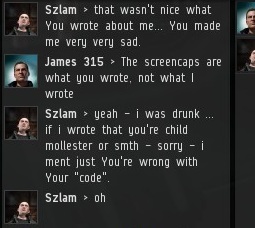 Later, Szlam sent me an apology EVEmail. He had decided to step down as the CEO of Flower Revage Cartel and leave the corp. blood valentine became the interim CEO; the remaining two members being left in his capable hands. 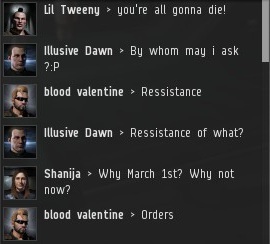 valentine's reign as CEO got off to a rocky start when he made a threat against one of our Agents. 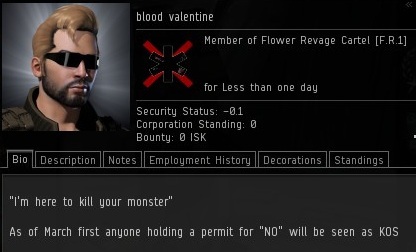 Some say valentine was given a temporary time-out by CCP, but no one can say for sure. If true, Flower Revage Cartel lost a significant chunk of its firepower at a critical moment in its history. 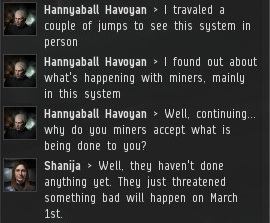 Nevertheless, rumors about something happening on March 1st spread like wildfire among the highsec miners. Rebel Lil Gangrel stoked the flames. He hoped to act as an informant to the resistance. And so here we stand, on the precipice of the March 1st apocalypse. 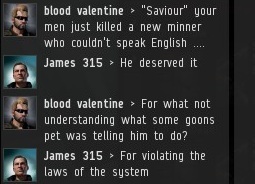 Will the permit-holding miners of highsec be slaughtered? Or will nothing happen? 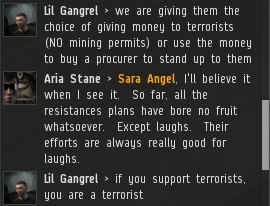 Regardless, I am confident that the Code-compliant miners of highsec will face any challenge with absolute courage and steely resolve, just as the brave Londoners held up against the Blitz so many years ago. 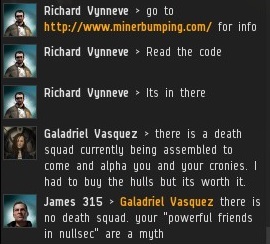 After all, if a miner renounces his permit, he'll just get blown up by the Knights of the Order. Stay strong, miners! 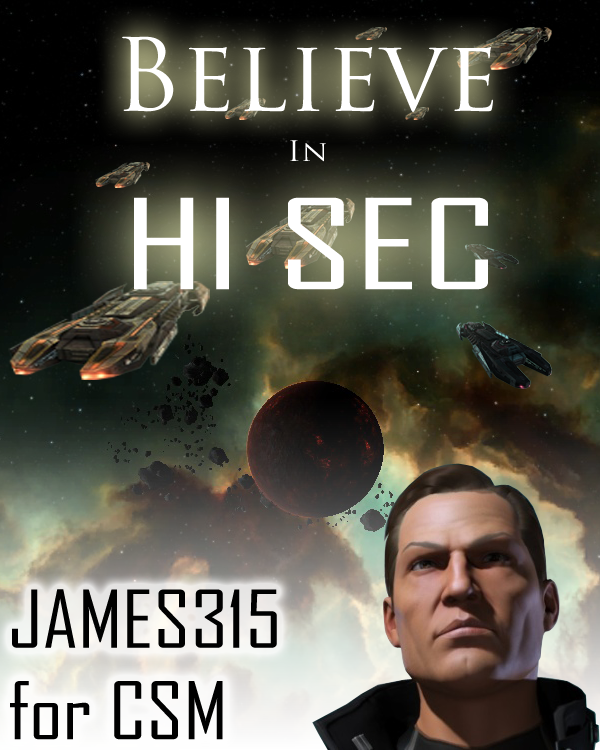 As part of my campaign for CSM8, I've been writing a series of articles about my platform, my philosophy of campaigning, and my vision of how the CSM should interact with CCP. I would link all of those posts here, but if you haven't read them already, just scroll down the main page. And while you're at it, enjoy some of the other posts I've made this month. Just because you came here to read about the CSM doesn't mean you shouldn't take advantage of an opportunity to read some other great stuff. ...Which just happens to be a great segue into the theme of today's post. I officially announced my CSM8 candidacy earlier this month in a post on MinerBumping. 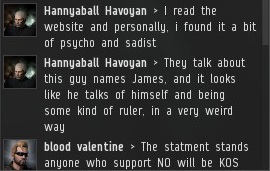 This raised a few eyebrows, since most candidates declared by making a thread in the Jita Park Speakers Corner on EVE-O. That particular subforum is designated for CSM-related topics. Members of the current CSM can engage with the EVE community there, and candidates for the next CSM can reach out to potential voters. It's a great subforum, except for one thing: Very few people actually read it. 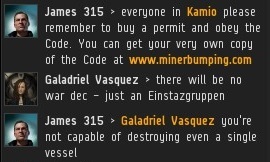 While MinerBumping averages nearly 4,000 hits per day, the viewer counts on the individual threads in Jita Park show that they struggle to attract even a small fraction of MinerBumping's traffic--even though Jita Park is open and (presumably) relevant to a community of hundreds of thousands of players. 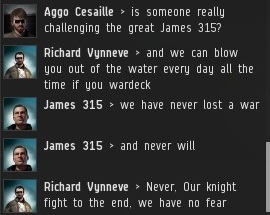 The problem with Jita Park is that it's one of countless "graveyard" subforums; threads go there to die. 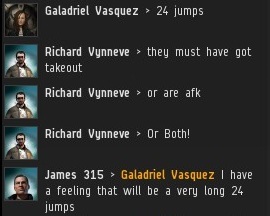 People get a larger audience spamming Jita than they do by posting in Jita Park. 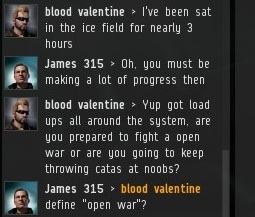 EVE-O is subdivided into so many narrow little subforums that EVE players don't bother to read them. The only subforum with a healthy flow of traffic is the EVE General Discussion subforum, which is for--appropriately enough--uncategorized, miscellaneous topics. But if a topic in General Discussion fits too neatly into the realm of another subforum, it will be whisked away into oblivion. It would be easy to cure many of EVE-O's ills simply by combining most of the subforums into General Discussion. This wouldn't require extra work--in fact it would take less work, since moderators wouldn't need to move from subforum to subforum and send threads from one place to the next. So why don't they do it? Institutional inertia and an excessive love of organization. They're powerful things. 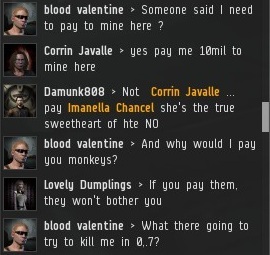 I honestly wouldn't be surprised if EVE-O never got fixed. 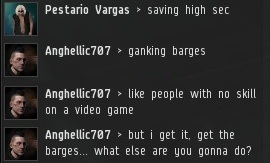 At this point, you might be wondering why I'm talking about EVE-O in a post about the CSM. 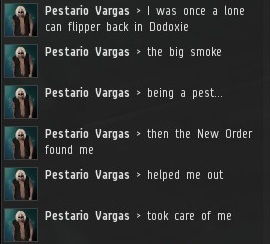 It seems to me that the CSM suffers from a lot of the same problems EVE-O does. No one wants to think outside the box or break away from the institutional routines. 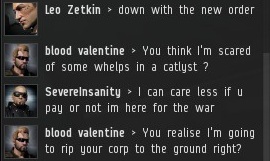 EVE has serious problems and needs bold, dramatic solutions to set things right. But when you're dealing with people who think merging dead subforums is too radical, it's hard to get anything accomplished. Instead, we see only drift. 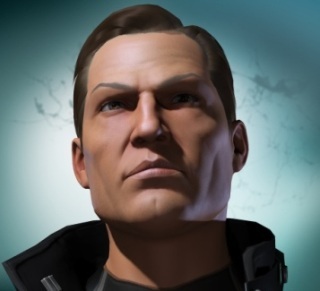 CCP and the CSM need to hit the "reset" button and clear away all of the old habits and practices that tie them down. 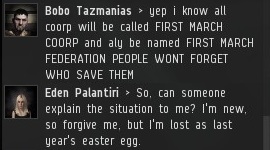 Aside from nerfing highsec aggression, which seems to have a permanent place on the agenda, it's hard to say exactly what CCP's preexisting plans are for CSM8's term. Whatever they are, I would advise against getting too attached, because we need to set those plans aside in favor of dealing with more urgent matters. There's a lot of cynicism about the CSM these days, and rightly so. 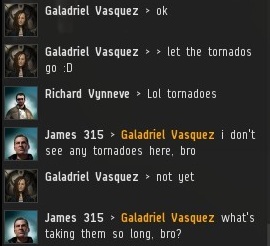 The first item on the new agenda should be to send a clear signal to the EVE community that things will not continue as they have been. 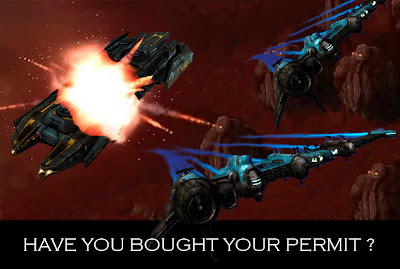 Imagine if, the day after CSM8 took office, CCP and CSM8 issued a joint statement announcing the exoneration of Kugutsumen and the normalization of relations with the Kugutsumen.com community. They could explain that their baggage is getting thrown away, that BoB was a joke, and that they have no further reason to hold onto old grudges. I suspect the first reaction of most people (if they know who Kugutsumen is) would be something like: "Wow. 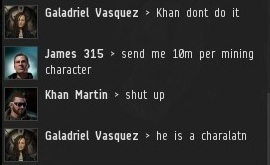 This isn't the old CCP/CSM we're dealing with." 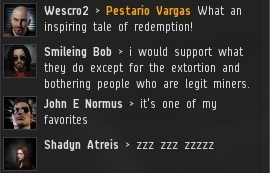 As with the reformation of EVE-O's subforums, it would cost CCP nothing (in terms of money, time, or anything else), and it would deliver a powerful message to the community. 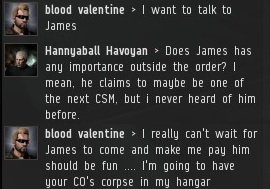 Namely, that CCP and CSM8 intend to get down to business. My vision of how I would fit into the daily operations of CSM8 will be the subject of Part 2. We've been teetering on the edge of the 59 billion mark lately, and today we finally go over. 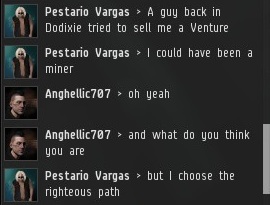 An artful snipe by Vin King for 14 shares was just enough to earn him a Supreme Protector's Tip of the Hat™. But you know what they say, a Supreme Protector's Tip of the Hat™ is a Supreme Protector's Tip of the Hat™, no matter how you slice it. 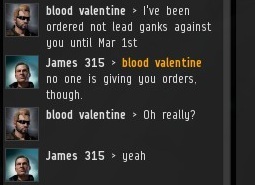 In the meantime, ganking Catalysts are rolling off the assembly line and the Code violators keep on burning. Keep going! Never undock without one. 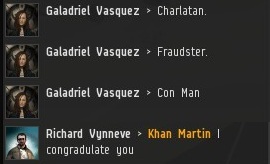 Send me 10 million isk; it's a small price to pay for piece of mind and the heartwarming satisfaction of Code-compliance.